The Tennessee Math Teachers Association (TMTA) held a regional math competition at Volunteer State Community College recently. Hundreds of students from schools across the area competed in the following categories: Algebra I and II, Geometry, Statistics, Precalculus, and Calculus. Winners will go on to compete in the state competition. The schools participating included: Beech High School, Davidson Academy, Hendersonville High School, Merrol Hyde Magnet School, Portland High School, Gallatin High School, Station Camp High School, Pope John Paul II High School, and Trousdale High School. The top students in each category had their photo taken with Vol State president, Jerry Faulkner. Algebra I (left to right): Ann Grace Wade, Station Camp H.S., second place tie; Emma Wiggleton, Merrol Hyde, second place tie; Kolton Garvon, Merrol Hyde, first place; and Jerry Faulkner, Vol State president. Geometry (left to right): Abigail Carr, Hendersonville H.S., third place; Benjamin Gittins, Hendersonville H.S., second place; Galen Wei, Merrol Hyde, first place; and Jerry Faulkner, Vol State president. Algebra II (left to right): Joseph Rodriguez, Merrol Hyde, third place; Maitreya Dixit, Beech H.S., second place; Matthew Shipley, Pope John Paul II, first place; and Jerry Faulkner, Vol State president. Statistics (left to right): Benjamin Isenberg, Station Camp H.S., third place; Alexander Krneta, Hendersonville H.S., second place; Henry Sprouse, Hendersonville H.S., first place; and Jerry Faulkner, Vol State president. 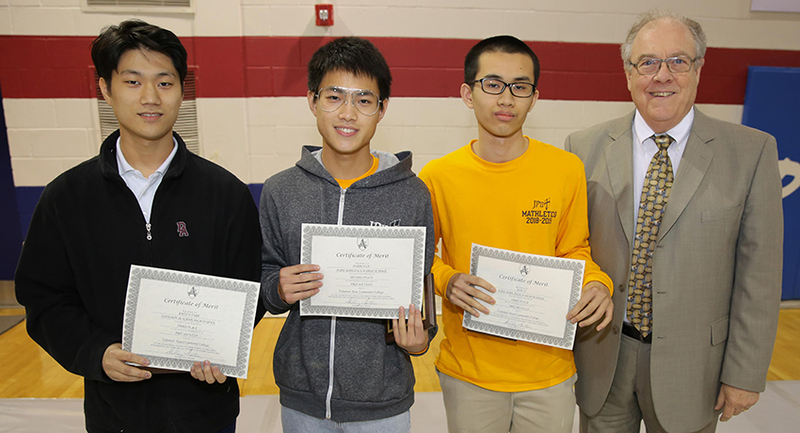 Precalculus (left to right): Kihyun Park, Davidson Academy, third place; Darren Liu, Pope John Paul II, second place; Hao Yi, Pope John Paul II, first place; and Jerry Faulkner, Vol State president. Calculus (left to right): Travis Craig, Station Camp H.S., tied for third place; Nicholas Dennison, Gallatin H.S., tied for third place; Nilabh Saksena, Hendersonville H.S., second place; Ian Dilick, Pope John Paul II, first place; and Jerry Faulkner, Vol State president.